Why fish with a guide? What's a guided fishing trip like? Hi! I'm Greg Crafts, your fishing guide for Toledo Bend Reservoir. I own and operate Toledo Bend Guide Service. If you're ready to catch fish, I'm ready to show you where and how. And if you want great accommodations for your stay at Toledo Bend Lake, you'll really enjoy my Toledo Bend Cottage. Peebles Family with Excellent White Bass Catch! Who runs Toledo Bend Guide Service? I, Greg Crafts, am the owner and proprietor of Toledo Bend Guide Service. You may find the name familiar from the fishing reports I furnish to numerous internet web sites and various print publications. Is Toledo Bend a large lake? Toledo Bend is the largest man-made lake in the South. It was the largest in the world when it was originally constructed in the late sixties. It covers over 186,000 square acres, and is over 80 miles long. If you stretched the shoreline out it would run from New Orleans to New York. Where on the lake do you operate? I operate out of Huxley Bay Marina on the North end of the Texas side of the lake, which is approximately 20 miles east of Center, Texas and 20 miles south of Logansport, La. It is one hour from Shreveport, La., three and half from Dallas or Houston. Huxley Bay Marina has a deep-water boat ramp for accessing the lake during low water conditions. Many feel the North end of the lake is the premiere fishing area and the majority of the tournaments are won with fish coming from the north end of the lake. What is your experience as a guide? I have fished Toledo Bend since its inception in the early sixties. I live on the lake and have been a full-time licensed guide since 1993 spending over 200 days a year fishing Toledo Bend. What can we fish for? I specialize in fishing for black bass year round. 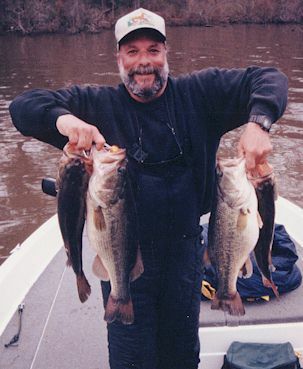 The limit is eight bass per person with a 14 inch minimum length. I also fish for crappie, white bass, and bream and maintain numerous brush tops for crappie. The crappie season begins in the middle of October and runs through January. 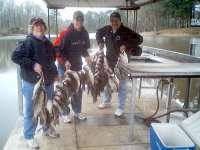 We have a creel limit of 25 crappie per person per day with two pounders not being unusual. The white bass run starts in late February and runs through April with plenty of schooling action in the summer. The creel is 25 per person per day. The bream spawn starts in April and runs through June. What kind of equipment do you use? 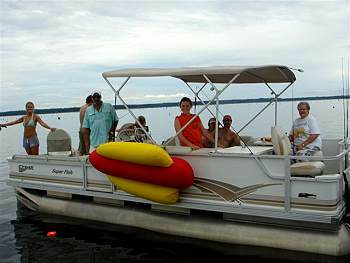 I operate a 20 ft. Skeeter Bay Boat that can accommodate up to three customers comfortably. It is able to run the lake in rough water conditions and fish the main lake when other boats are sitting on their trailers. I also operate a 22 ft. Crest center console pontoon boat that can accommodate six to eight guests, complete with private toilet facilities. 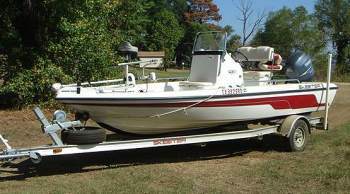 It's great for Crappie, White Bass, and Bream fishing, touring the lake, or towing the kids on a raft. What are your Rates and Cancellation policy? The fee for a guided pontoon boat fishing trip for Crappie, White Bass or Bream is $550 for one to four people, and $100 per person over four. The fee for a Black Bass trip for one to two people is $550, and $100 for an addition person (3 people maximum). Both pontoon boat trips and Black Bass trips consist of six hours (including cleaning fish) and begins at a mutually agreed upon meeting time. If you wish to fish over six hours, a charge of $50 per additional hour will be charged. Pontoon boat cruises and tours (2 hour trips) start at a minimum of $200 or $35 per person up to eight people and $50 for each additional hour over the first two hours. Guests are encouraged to bring their own equipment, however, tackle can be provided at no charge for small groups and for $15 per person for large groups. If live bait is required the cost will be applied. I'll be happy to clean your fish at no charge if they are cleaned within the regular fishing time, otherwise a $35 per hour charge will be applied. If you need additional guides for your group a 10% booking fee is applied. On large groups a deck hand is usually on board to help out with your needs and there is a 10% fee for his services. One half the total rate is required for deposit to confirm the dates you wish to fish (Visa, MasterCard or American Express credit cards). Cancellations must be made 30 days in advance for a refund of your deposit less a 10% booking fee. Refunds on cancellations within 30 days will be given if I am able to fill the time completely or proportionately with another booking. If a trip has to be cancelled due to weather (dangerous fishing conditions, high winds or lighting), the deposit will be applied toward another trip within sixty days. Is a Liability Waiver required? Due to the inherent risks of a guided fishing trip, foreseeable and unforeseeable, and the number of frivolous lawsuits, a waiver of release of liability must be signed prior to your trip. Can you help me plan my trip and make the necessary arrangements? I'll be happy to provide you with information for your trip and lodging available for any size group from luxurious, private lodges to moderately priced accommodations. See our Lake Cottages on this site http://toledobendguide.com/cottage/index.asp for accommodations. I can also arrange for additional professional guides and transportation at a reasonable fee if you fly in by private plane. What do I need to bring and license info? Please remember to bring rain gear, appropriate clothing for the season, sunglasses, sunscreen, camera, rods/reels, tackle, drinks, snacks, medicine, ice chest for your dressed fish and any other personal items. Either a Texas or Louisiana residential or temporary license applies for the whole lake unless you are fishing from the bank. If you are out of state, a Louisiana license is cheaper than a Texas license. You can obtain a Louisiana license by calling 1.888.765.2602 or visiting their website at http://www.wlf.state.la.us/licenses/fishing/recreational/fishing-licenses. A Texas license can be purchased over the phone at 1.800.895.4248 or in person at Huxley Bay Marina, Trail's End Gro. & RV Park, or at any Wal-Mart. Where can I get more information about the area? For additional area and historical information on Toledo Bend check out Toledo-Bend.Com. More questions? Feel free to contact me if you have any further questions. Click here for an Inquiry Form, or my e-mail address is gCrafts@bigfoot.com , or (936) 368-7151. If no one answers, please leave a message on my answering machine and I will get back to you as soon as I can. I'll be looking forward to hearing from you.